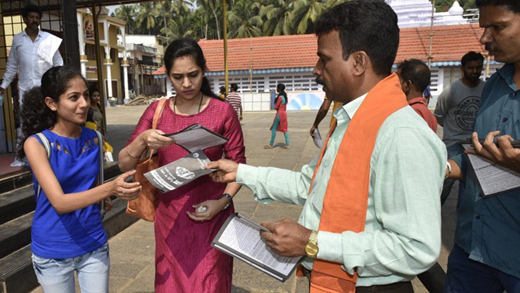 Mangaluru, Jan 23, 2018: Three district units in Udupi of Vishwa Hindu Parishad (VHP), Bajrang Dal and Durga Vahini launched a signature campaign against ‘love jihad’ near the MGM College Bus Stand here on Jan 22, Monday. They also distributed hand bills. Speaking on the occasion, P. Vilas Nayak, president of district unit of VHP, said there were cases of ‘love jihad’ where Hindu girls were being enticed by Muslim boys and then converted into Islam. Though people earlier used to ignore it, a case on this matter from Kerala had even reached the Supreme Court, he said.